While you’re holding it above your head? Okay, sure! Your funeral, pal. Also, seriously, it looks like he’s fighting Gorilla Grodd’s great grandfather. And might I say, alliteration is fun. Maybe it’s his first day as a “mastermind”….and sadly his last. This was plan B. Plan A involved Acme brand exploding boomerangs … super genius! You have to admit, though, this plan has the benefit of having never been tried before. So at least he’s innovative. Yeah, at least this attack will be a surprise. Not even Batman could have seen that one coming. I would have called this “Great Moments in Science Experiments”. I just noticed, is the bad guy not wearing any pants, or are they just the same color as his skin? Mr. Flame?!?! 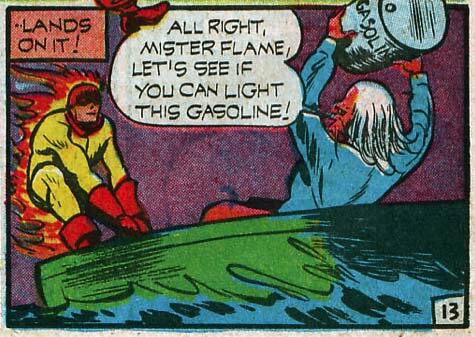 See Superheroes in 1941 had the least thought out names in history. Maybe it’s a special cool flame fed by some substance that burns at a lower temperature than gasoline? Ironically, his plan just might work. Liquid gasoline doesn’t burn. Gasoline fumes burn. You can actually douse a flame with liquid gasoline. Not something I would try on a superhero in a small boat, but not impossible. So, “The Flame” has control over fire. He can actually travel through it (as in, if there’s a candle somewhere a hundred miles away, he can jump into a fire where he is and come out of the candle’s flame), he can control it almost like Green Lantern does his ring’s energy, and it doesn’t burn him at all. And yet, every single story features the criminal trying to burn him up in some way. Every time. Even here, after this guy has already failed to kill The Flame by tying him up and leaving him in a burning warehouse, his big plan is to fling a can of gasoline at him. In a wooden boat. In the middle of the bay. Attention Criminal Underworld: You might be able to fight fire with fire, but you can’t fight The Flame with it. He’d have more luck just pushing him off the boat. Just saying.